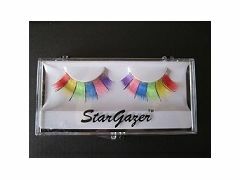 Stargazer's range of reusable neon & foil lashes are designed to add fun to any look. The bright colours attract attention & the foil catches the light to add some sparkle. They are easy to apply & each pair comes complete with a tube of eyelash glue.